Virtually contradicting Prime Minister Narendra Modi's claim that India is not facing a jobs crisis but data crisis, the country's top data consultating firm, Centre for Monitoring Indian Economy (CMIE) has declared that the labour force participation rate -- expressing the desire the able-bodied persons to find a job -- continues to decline. 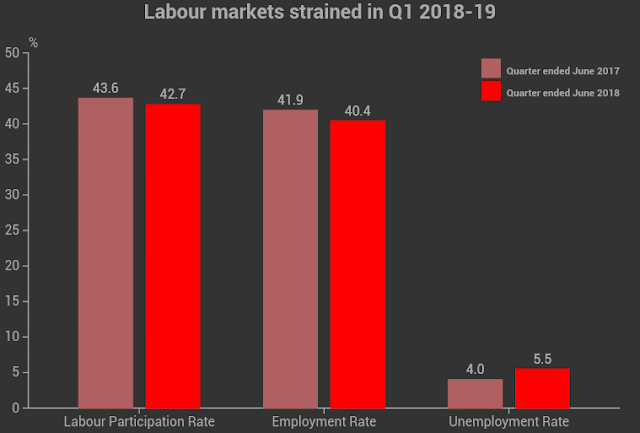 According to CMIE's latest estimates, the labour force participation rate fell from 46.1 per cent in fiscal 2016-17 to 43.5 per cent in 2017-18, and it is further down to 42.7 per cent in the first quarter (April to June) of the present financial year, 2018-19. In a fresh incisive analysis based on CMIE's labour force data, CMIE managing-director Mahesh Vyas says, "It is the labour force participation rate that is a better measure of the labour market conditions in India. It is not good if the number of people willing to work declines. It is not good if an increasing proportion of the working-age population express no interest in working. But, this is what happened..."
He believes, "The ripple-effects of the twin shocks of demonetisation and Goods and Services Tax (GST) continue to impact the economy. Consumer demand is muted. Persistent low food inflation is a possible reflection of this. Low investment demand is a clear reflection of poor consumer demand. Capacity utilisation is still low. In such conditions, the stagnation we observe in employment is understandable." As for employment, says Vyas, things "turned worse" here, too. Thus, during the first quarter of 2018-19, persons employed fell to 401.9 million as against 406.2 million in in 2017-18 and 406.7 million in 2016-17. Thus, he adds, employment rate fell to 40.4 per cent in the first quarter of 2018-19, as against 41.45 per cent 2017-18 and 42.59 per cent in 2016-17. Comments Vyas, "Employment must grow because, as population grows, the number of people seeking employment also increases. If employment is stagnant while the population keeps growing, the employment rate (which is the proportion of working-age population that is employed) declines." Vyas suggests that failure of the jobs market to pick up is a direct reflection of the current economic scenario. According to him, "Fiscal 2017-18 was a difficult year for the Indian economy. Real Gross Value Added (GVA) growth slowed down to 6.5 per cent compared to 7.1 per cent in the previous year. This was also the worst year for growth since 2013-14. The investment ratio, at 28.5 per cent was the lowest since 2011-12. It has been falling relentlessly indicating declining investment demand in the country." He adds, "This fall in investment demand is also captured by CMIE’s CapEx database. Announcement of new investment projects declined by 38.4 per cent and completion of new projects declined by 26.8 per cent in 2017-18 compared to the previous year. Foreign direct investments were down by 15 per cent." Squarely blaming demonetisation for the present economic crisis, Vyas says, "After demonetisation a large number of unemployed persons stopped looking for jobs. These were mostly youngsters, many of them were uneducated and were women. Why did they stop looking for jobs is a different matter. The relevant and important observation is that they stopped looking for jobs." He adds, "As these unemployed persons stopped looking for jobs, they were not called unemployed any more. They hadn’t found jobs so they were not classified as employed either. They simply exited the labour force. This led to shrinking of labour force and a misleading fall in the unemployment rate." All this, believes Vyas, suggests that if "2017-18 was as difficult year, 2018-19 is a challenging year already." He adds, "Rains have been somewhat erratic, kharif sowing is 10 per cent below last year’s, crude oil prices have risen, Foreign Portfolio Investments (FPIs) are exiting, the rupee is weak, the balance of payments is vulnerable and the fisc is in danger of running amok. These are not the best times to expect private entrepreneurs to invest and so not the best time to find new jobs."